Zion Market Research has published a new report titled “Anti-counterfeit Pharmaceutical Packaging Market by Usage (Covert Features, Overt Features, Forensic Markers, Tamper Evidence, Track & Trace Technologies) and by Technology (RFID, Security Inks & Coatings, Security Printing & Graphics, Hologram, Mass Encoding and Others): Global Industry Perspective, Comprehensive Analysis and Forecast, 2018 - 2024”. 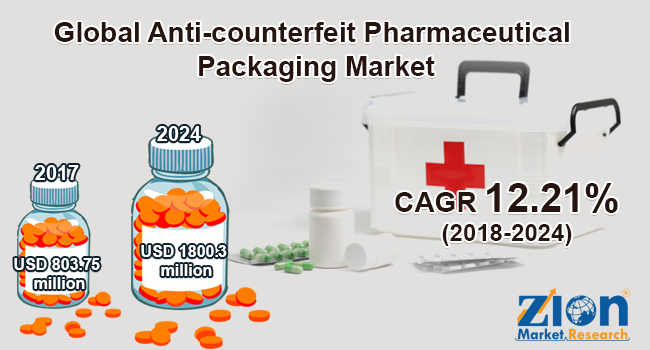 According to the report, global anti-counterfeit pharmaceutical packaging market was valued at approximately USD 803.75 million in 2017 and is expected to generate revenue of around USD 1800.3 million by the end of 2024, growing at a CAGR of around 12.21% between 2018 and 2024. Duplication of medical and pharmaceutical products in the modern-day world is a rising concern among developed and developing economies across the globe. This infringement of pharma-products is seriously affecting the growth and development of the pharmaceuticals industry. Counterfeiting results in extensive losses not only in terms of revenue but in terms of reliability as well. Making an exact replica of the pharma-products and labeling with the brand and trademark names of rightful product manufacturers has become a matter of serious apprehension for pharmaceutical organizations. Thus, the organizations in the pharmaceutical industry worldwide are rapidly working on ways to stop duplicate products from penetrating into the markets so as to avert the negative impact on their sales revenue and their brand value. Continuous advancement and technological upgradation in anti-counterfeit packaging technology and raising awareness among the manufacturers and consumers are factors that are majorly fueling the market growth and development. Stringent rules and regulations formulated by the government in various countries around the world are influencing the big companies to make investments in advanced anti-counterfeit technologies. Such factors are expected to drive the anti-counterfeit pharmaceutical packaging market growth over the forecast period. The anti-counterfeit pharmaceutical packaging market is fragmented on the basis of usage which is further divided into covert features, forensic markers, tamper evidence, overt features, track & trace technologies. Track and trace technologies segment held the major revenue share in 2017. The growth is attributed because of its technical implementation. Basically, with the help of track and trace technologies, it is easier to track down goods and products as it helps in determining their location. In addition, with help of trace and tracking technologies, the supply chain and logistics division of any organization can be regulated. Based on technology, anti-counterfeit pharmaceutical packaging market has been segmented as RFID, security inks & coatings, security printing & graphics, hologram, mass encoding, and others. RFID segment is expected to contribute for significant revenue share in 2017. The growth of the segment is attributed to the anti-counterfeit label data of pharmaceutical products, which can be achieved with the help of RFID technology. Also, with the help of RFID technology, the duplication of original materials can be prevented. Europe, Latin America, North America, Asia Pacific, and the Middle East & Africa are the regional segments of the global anti-counterfeit pharmaceutical packaging market. North America held the major revenue share in 2017 and is likely to continue its regional superiority over the forecast period. The growth is attributed due to stringent regulations formulated by the government coupled with the FDA. In addition, the region is the major biologics research hub, which exports medical and pharmaceutical products across the globe. Such factors are contributing to the growth of the market in the region. The Asia Pacific is predicted to provide significant opportunities for the anti-counterfeit pharmaceutical packaging market. The growth of the region is anticipated due to raising awareness among the consumers and manufacturers regarding infringement of pharma-products. Some of the industry players operating in the anti-counterfeit pharmaceutical packaging market include Zebra Technologies Corporation, Dennison Corporation, E.I. du Pont de Nemours and Company, AlpVision SA, Sicpa Holding SA, Applied DNA Sciences Inc., Amcor Limited, Authentix Inc., CCL Industries Inc., and Atlantic Zeiser GmbH.